On occassion, we will be posting items that we cannot identify. Typically, those will be items from the collection of artifacts, but today the staff stumbled across something special. 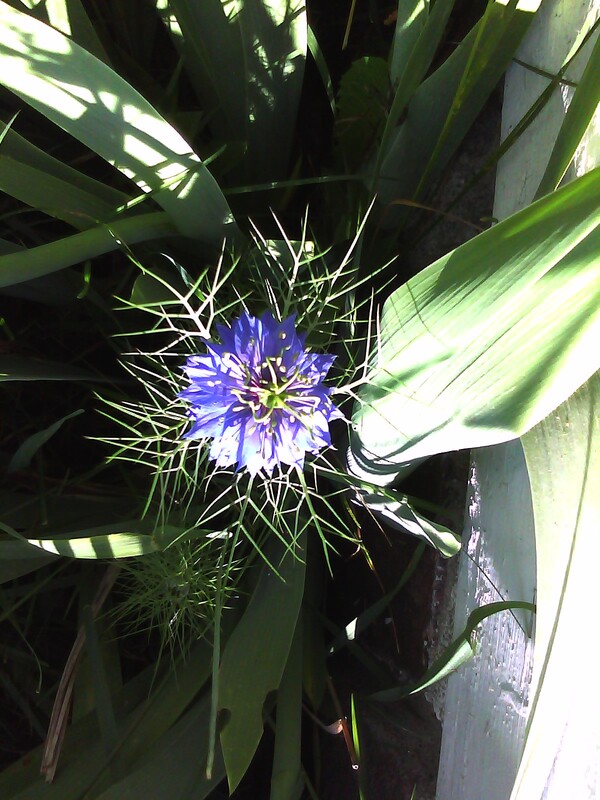 This flower was spotted outside of the Bristol Inn. 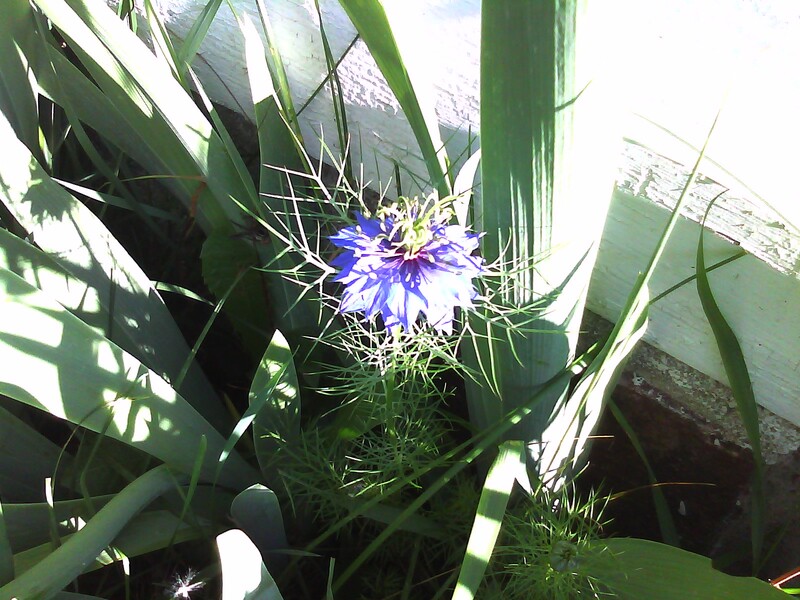 It stands about a foot tall and has a pretty purple/blue flower with a light green stamen sticking out of the center. Any ideas? This archive features a recent Charlton Park donation. Although donation of items for the collection is limited, we felt that they were important to the Hastings, MI community. 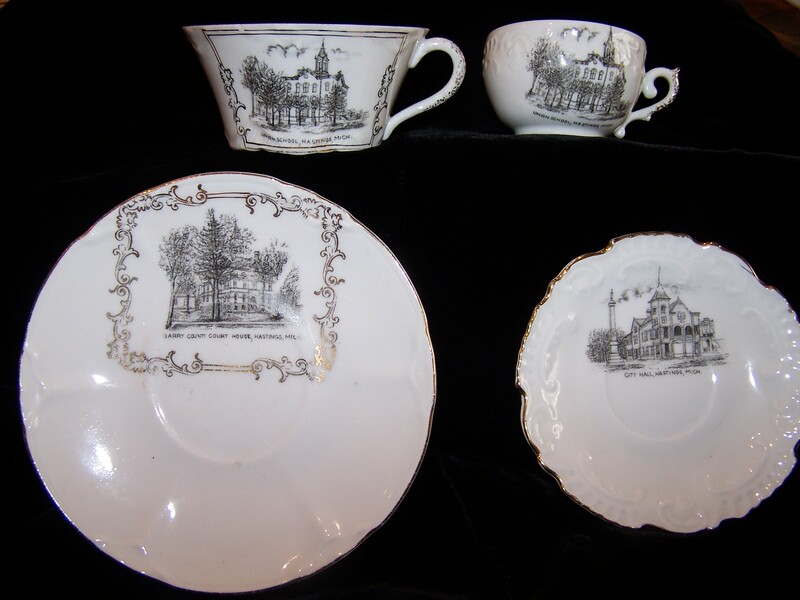 Four pieces of souvenir porcelain depict Hastings landmarks (City Hall, Union School, and the Barry County Courthouse). The images are black transfer and the edges are gilded. The underside of the saucers read: Made by Fr. B.Taylor Co. manufactured for J. F. Whitney & Co. Hastings, Mich. Any company information you may have would be greatly appreciated! These pieces were donated by Carolyn Loucks Moore and Emelie Loucks Horsley. They date from around 1900. The pieces originally belonged to LouAnna Poucher Johnson Patton (1866-1954), the donor’s step-grandmother. She lived in Hastings until 1908 and moved to Cloverdale, MI when she remarried. LouAnna and her husband ran the Cloverdale General Store until the late 1920’s. We are pleased to have these items in the collection! Antique carnival glass was manufactured between the early 1900s and early 1930s, by various companies around the United States and abroad. Carnival Glass received its name because it was used as prizes at carnivals. Molten glass was pressed in a two part cast iron mold. The mold was locked together and then a plunger was inserted after the glass was poured in. The plunger was pushed down by a hydraulic press to make sure that the glass was well distributed throughout the mold. Once the glass had cooled, it was removed from the mold and reheated so any ruffles or shaping could be added. While it was still hot the surface was sprayed with a metallic salt solution (dope) to give it the irridescence or oil on water appearance. There are over 2,000 known carnival glass patterns, most were made by American companies such as Dugan Glass Company, Fenton Art Glass Company, Imperial Glass Company, Northwood Company, U.S. Glass Company, and Millersburg Glass Company. Some companies sold their molds and many were remanufactured starting in the 1970s. To be a true collector, you must do your research! Patterns come in many shapes and are often interchangeable. Discovering the pattern of your Carnival pieces may seem like a treasure hunt, but you will enjoy the search. The value of carnival glass lies in its color, which can be determined by holding it up to light and looking through the bottom. Carnival glass items can be found in green, marigold, red, amethyst/purple, aqua, white, cobalt blue, smoke and many shades in between. Carnival glass comes in all the colors of the rainbow! Want to learn more? Check out David Doty’s site: http://www.ddoty.com/index.html. You will be overwhelmed by the shapes, patterns and colors of Carnival Glass! Carwile, M. Standard Companion to Carnival Glass. Collector Books: Paducah, KT. 2007. Edwards, B. and M. Carwile. Carnival Glass: The Best of the Best. Collector Books: Paducah, KT. 2004. Edwards, B. and M. Carwile. Standard Encyclopedia of Carnival Glass. Collector Books: Paducah, KT. 2006. Quintin-Baxendale, M. Collecting Carnival Glass. Francis Joseph Publications: London, England. 2002. Schroy, E.T. Warner’s Carnival Glass. KP Books: Iola, WI. 2004. 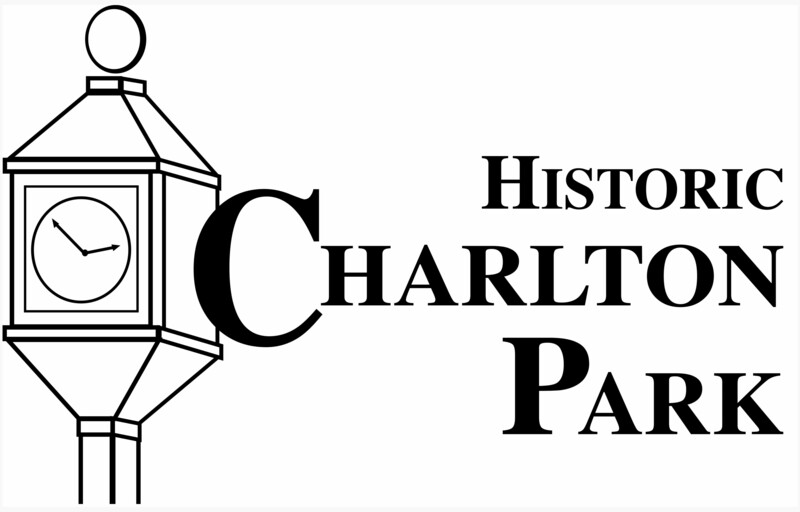 The Exhibition Hall display at Charlton Park will be getting finished up over the next couple of months. Look for new signage and object information to complete the display. The horse treadmill, as well as one for a dog(! ), will be on display in the center when the exhibit is complete. 2 Wendel, C.H. 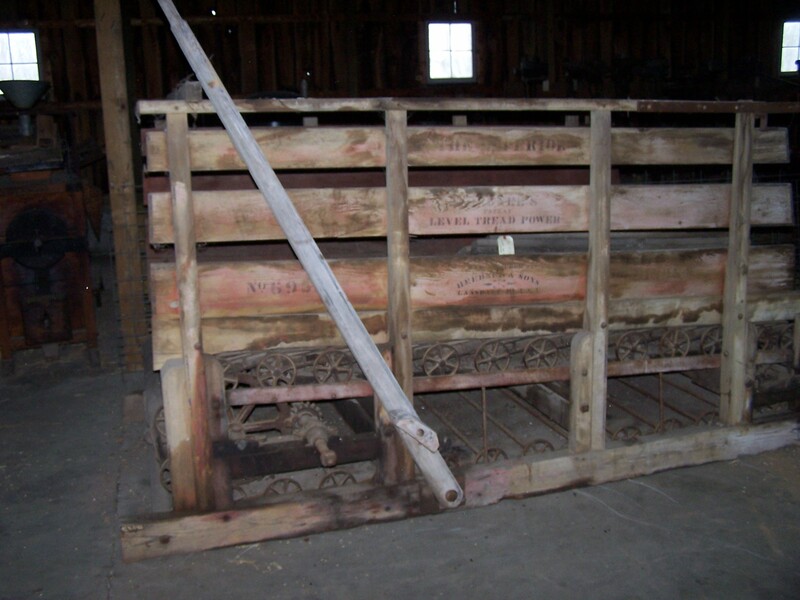 Encyclopedia of American Farm Implements & Antiques. Iola, WI: Krause Publications, 1997. 3 Barlow, Ronald S. 300 Years of Farm Implements and Machinery. Iola, WI: Krause Publications, 2003.